Cybozu held a kintone seminar in Thailand on July 5 through 8 at three different industrial area, which were Sriracha, Korat and Bangkok with our official partner, Material Automation (Thailand) Co., Ltd. (MAT). Though kintone is versatile for any industry, we introduce our kintone solutions specific to the Manufacturing industry in this seminar. Cybozu Asia Marketing Director Takamitsu Suzuki spoke about 'Importance of 現場　visibility and know-how / knowledge management in Thailand' in the first session. To keep the higher manufacturing yield and performance in factories, staff training and defect product management is essential. knowing that fact, it is true that many managers are straggling to make it happen. Yuichiro Kido, Cybozu Asia Business Development Team, took charge of the second session of the seminar. 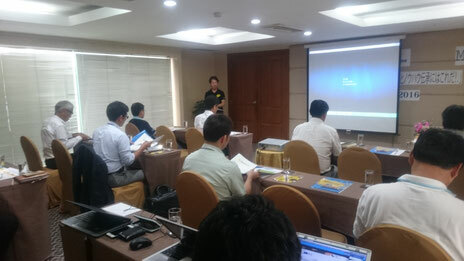 He demonstrated kintone apps development process and showed the attendees how easy to create, for example, Defect Management apps and Staff Skill Evaluation apps on kintone. The second Manufacturing focused seminar will be held in September. Please check the details below and we look forward to seeing you soon!